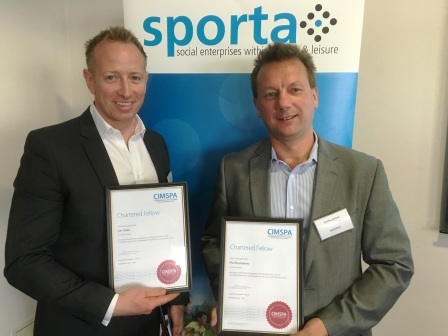 At the recent Annual General Meeting of Sporta in Bournemouth, Jubilee Hall Trust’s top executives were presented with Chartered Fellowship of CIMSPA. Chief Executive, Phil Rumbelow and Operations Director, Jon Giles, had undergone a rigorous evidence-based appraisal to ensure that they had demonstrated the qualities needed to qualify for the award and were delighted to receive it in front of their peers. ‘I have been a member of most of the previous incarnations of the institute – ISRM, ILAM, ISPAL etc – and was very pleased when, in 2012, our industry finally got Privy Council approval as the Chartered Institute for the Management of Sport and Physical Activity. The Institute provides leadership, support and empowerment for all professionals working in the sector, and it is fantastic to be recognised.